Bernhard Horwitz (1808-1885) was a German chess master. Horwitz was born in Germany, and went to school in Berlin, where he studied art. From 1837 to 1843, he was part of a group of German chess players known as "The Pleiades". He moved to London in 1845. In 1846, he lost a match against visiting master Lionel Kieseritzky, and another against Howard Staunton, losing 15.5-8.5. His best chess result was winning a match against Henry Bird in 1851. He played in the first international chess tournament, London 1851, again beating Bird in the first round, but losing to Staunton in the second and getting knocked out by J. Szen in the third. 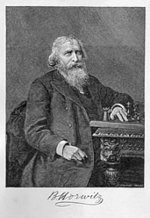 Horwitz�s Chess Studies (1851), co-authored with Josef Kling, is an important work on the endgame study and endgames in general. This article is based on the article Bernhard Horwitz from the free encyclopaedia Wikipedia and stands under the GNU-Licence for free documentation. In the Wikipedia a list of the authors is available.